The Magic Eight Ball, the ancient oracle of daily guidance, has been born again for webOS. No longer the self-centered device it was, it now can sense its environment and is aware of the current weather. This is a bit unfortunate because it seems to have a mood disorder that makes its outlook very dependent upon the weather. Sunny days and the Moody Eight Ball is going to be beaming with optimism. On cold and dreary days, you'll be getting advice from a malcontent. You have been warned. The Moody Eight Ball was the creation of the preDevCamp:New York hosted by BlueSwitch in downtown Manhattan in August 2009. The event was led by Michael Prenez-Isbell from BlueSwitch in their New York offices, and Eric Marthinsen of Agile Commerce led the Hackathon team of 30 developers from such diverse companies as 360iDev, Merrill Lynch and American Express. 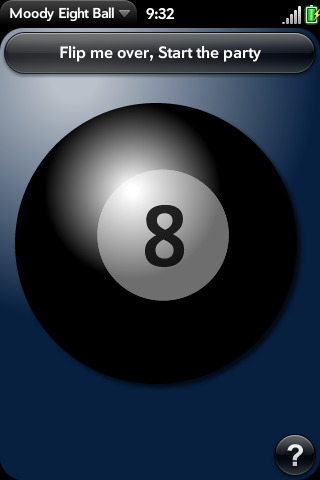 The Moody Eight Ball was coded over the course of two days and was many people's first foray into webOS development. The application was designed to exploit many of the capabilities of webOS and the device, including the accelerometer, location services, web service integration, and the clipboard.